The Ford SYNC® and MyFord Touch® connectivity systems are resonating with buyers, ranking as an important part of their vehicle purchase decision. In fact, 56 percent of drivers of 2011 and 2012 models said in owner surveys that SYNC and MyFord Touch were important to their purchase decision. The popular and flexible systems are receiving an upgrade, launching on 2013 Ford Taurus and Flex, as well as for current customers with eligible systems. For current U.S. customers, Ford will mail out MyFord Touch and MyLincoln Touch upgrade packages that include a USB flash drive with the updated software, a notification letter, detailed instructions for the 60-minute download and an updated user guide. Navigation-equipped vehicle owners also will receive an updated SD card with all-new, updated map data. If preferred, customers also can elect to take their vehicle to a Ford or Lincoln dealer for installation of the upgrade. There are three videos in the playlist above that share more information about the features and changes in this upgrade. As capable and popular as MyFord Touch is now, the flexibility of the underlying SYNC software platform allows for regular updates and upgrades as the technology evolves. The touch screen interface has been enhanced with simpler graphics and bolder text that is easier to use. The response time of the touch screen is now much faster so drivers can tap controls and focus on driving. Already popular voice controls now provide even better recognition so drivers can tell their cars what to do, keeping their eyes on the road and hands on the wheel. 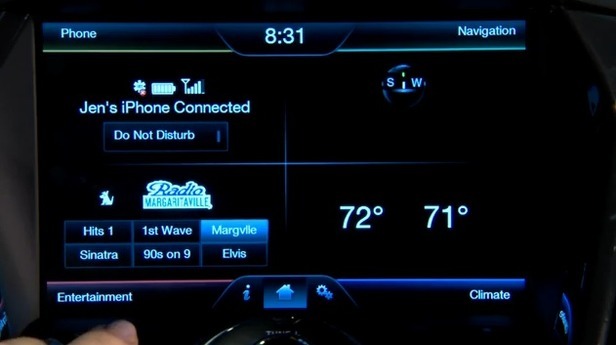 In addition to the simplified interface and faster performance, Ford engineers added new features including better phone compatibility, support for tablet computers and Audible audiobooks, improved navigation maps and destination entry. If you have any questions about the improved MyFord Touch and SYNC feel free to ask them in our comments section or you can Contact Us here.